These are really easy and the only cooking is melting the chocolate. After the balls have set up, melt the chocolate and shortening until smooth. Dip into the chocolate to coat evenly and lightly. Place onto a parchment or foil lined sheet pan to dry. In a bowl mix together the nuts, condensed milk, almond extract and coconut. Place onto baking sheet and let rest at room temperature for 4 hours or in the refrigerator for 1 hour. After the balls have set, melt the chocolate and shortening in a bowl over slowly simmering water. Stir until smooth. Dip into the chocolate to coat evenly and lightly and pull out with a meat fork. Place onto a baking paper or a foil lined baking sheet to dry. 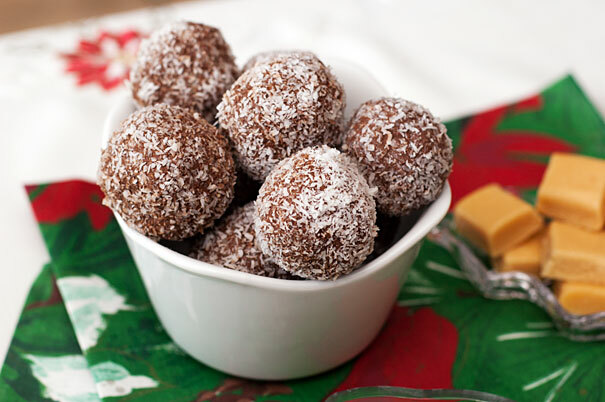 If like me you do these on a hot day and the chocolate refuses to set at room temperature, roll in dessicated coconut. Nobody will think it's not the real thing.